One bedroom condo ground floor unit directly on the beach. 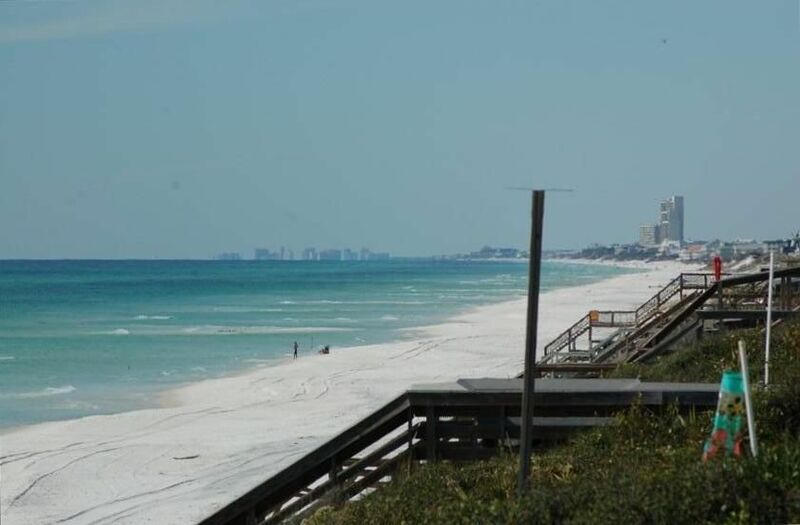 This condo is nestled between Seaside and Rosemary located about 15 miles from Panama City Beach. This is a quiet family beach and very private. We have all the comforts of home and welcome you to stay in our place and enjoy this gorgeous beach front condo. Our back porch walks right off onto the beach. There is a nice King sized bed in bedroom with bunk beds for adults or kids. We have a sleeper sofa that sleeps 2 as well. This a very upscale area and family oriented. This is a great place for a family vacation or a couples getaway. Plan your girls weekend out. If you like biking, then bring your bikes or rent them locally. There are many bike paths and a bike friendly environment with bike racks available on property. Book now and start planning your getaway. WE WELCOME YOU TO OUR FAMILY BEACH HOME. THE MAYNARDS HAVE OWNED AND MANAGED THIS PRIME PROPERTY SINCE 1983 AND MANY OF OUR GUESTS WERE INTRODUCED TO US WAY BACK THEN. I AM PROUD TO BE THE SECOND GENERATION TO OFFER OUR 'HOME BY THE SEA'. ONCE YOU ENJOY THE EMERALD COAST EXPERIENCE, YOU WILL KNOW WHY THE MAYNARD FAMILY IS PROUD TO CALL THIS 'OUR HOME BY THE SEA'. BY SELF MANAGING, WE ARE ABLE TO PASS ALONG THE 30-35% SAVINGS TO OUR GUESTS WHILE PROVIDING A PROPERTY THAT IS OUR OWN VACATION HOME. IT IS EQUIPPED AS SUCH AND OFFERS FAMILY ATMOSPHERE APART FROM THE "COOKIE CUTTER CONDO" OFFERED BY AGENCIES. OUR RATES ARE FAR SUPERIOR TO THOSE OF OUR NEIGHBORS UNDER AGENCY CONTRACT AND IT IS OUR WISH THAT THE SAVINGS WE PASS ALONG TO OUR GUESTS MAY INSTEAD BE USED TO PRODUCE MEMORIES THAT LAST A LIFETIME. We are nestled in between Rosemary and Seaside. We are in Seagrove Beach! We are just a 10 minute drive to Pier Park at Panama City Beach. It is really nice on 30A with quiet family friendly beaches. Our beach is very secluded from noisy crowds. You can walk right off our back porch to the beach and not worry about packing coolers and all the things you need for a day at the beach. If you forget something, just walk right up the steps to the condo. There is a nice verandah to relax and read a book and watch the children play in the sand. Cook dinners on our outside grill while watching the ocean and sunset. It is our families paradise. We are just minutes from Seaside and Rosemary. There are sidewalks that run the length of 30A for bikers or walkers. This is definitely a biking community with many places to rent bikes. Seagrove has been rated the most secluded beaches on 30A. THIS UNIT IS GROUND FLOOR AND BEACH FRONT. Walk off covered porch and sugar white sand is only steps away. Enjoy coffee at sunrise and cocktails at sunset. Moonlight walks on the beach end the day. BRAND NEW UNIT JUST INSTALLED SET IT AND FORGET IT. Brand new dryer unit that dries clothes in 40 minutes! IT'S A DISHWASHER FOLKS.................WHAT CAN I SAY. We have a Blue Ray CD player for movies as well and can also play Pandora. We have a paid subscription to Netflix so all movies from Netflix are free. LIVING ROOM TV IS VIDEO GAME COMPATIBLE. Elevated seating for breathtaking sunrise/sunset views. Table and chairs for outdoor dining. Plenty of space to store beach toys and equipment. Fully covered and weatherproof. HIGH BACK BAR STOOLS FOR THAT FROSTY ADULT BEVERAGE WHILE WATCHING AMAZING SUNSETS. Excellent location just 15 minute drive to Pier Park in Panama City. This beach is not crowded with much privacy! We are classified as Seacrest/Seagrove beach and voted the #1 beach on 30 A for privacy. We are 1.7 miles from Rosemary Beach and 5 miles from Seaside. There are so many nice restaraunts and shopping close by and many activities for the family. It's so nice to go out and enjoy all the activities along 30A and to take the family to Pier Park but then come back to a nice quiet walk on our secluded beach! It's Heaven on earth! BIKING PATHS THAT ALLOW PROTECTED ACCESS TO ALL AREAS IN BOTH DIRECTIONS ON 30-A. SECURE BIKE RACKS ARE LOCATED AT BOTH ENDS OF THE BUILDING. YOU MUST PROVIDE OWN LOCKING DEVICE. ACCESS TO BEACH IS LIMITED AND CROWDING IS NEVER AN ISSUE. WE DO ASK THAT WHEN YOU DEPART THE BEACH THAT YOU LEAVE ONLY FOOTPRINTS IN THE SAND. LOCAL VENDORS ARE LISTED ON REFRIGERATOR IF YOU DESIRE TO RENT CHAIRS,UMBRELLAS,BIKES,ETC. WE ALWAYS HAVE A SUPPLY OF BEACH TOYS FOR THE KIDS LOCATED IN A TOTE BOX ON BACK DECK.AGAIN,THIS IS OUR FAMILY'S BEACH HOME AND IS EQUIPPED VERY WELL FOR FAMILY VACATIONS AS WELL AS ROMANTIC GETAWAYS.